Since Jon Stewart vacated his post as longtime host of The Daily Show earlier this year, the internet has been rampant with articles speculating the famed comedian's next career move. Regardless of your political affiliations, it is safe to say that Stewart's presence is missed amongst the varying voices in the American political discourse. 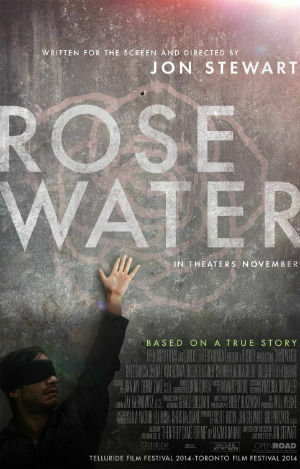 While only Stewart knows for sure what his next move will be, his directorial and screenwriting debut Rosewater may offer one plausible explanation. The film chronicles the story of Iranian-Canadian journalist Maziar Bahari as he is imprisoned in Iran for his coverage of the country's presidential election. The 2009 election resulted in outrage as reigning president Mahmoud Ahmadinejad won a landslide victory over his independent reformist challenger Mir-Hossein Mousavi. Domestic protests soon erupted as many citizens felt that the election results were fraudulent. The government swiftly went into action, banning any media, public demonstrations, or other forms of resistance from being proclaimed. Maziar Bahari was covering these protests when he witnessed government violence against the peaceful demonstrators. Despite being warned by local contacts against filming any government reactions, Bahari's journalistic instincts moved him to capture the outrageous event. As it did with so many other reporters, the Iranian government soon intervened and imprisoned Bahari. For 115 days, the journalist endured merciless interrogations for simply reporting on the truth. Jon Stewart trades in his comedic sensibilities for this bare-knuckle look at journalistic injustice. Based upon Bahari's own book about his experiences during his incarceration, Rosewater paints a bleak picture of Iran's treatment of visiting journalists and its corrupt political system. Bahari's story shows the lengths that the country was willing to go to in order to maintain the propaganda of a compassionate and beloved leader. From a political standpoint, Stewart does an excellent job in creating outrage at Bahari's unjustified treatment. Unfortunately, brief glimpses at Bahari's pregnant wife who is waiting desperately for her husband to return to their London home, do little to humanize the situation. This denies the film of ever truly connecting on an emotional level. It ends up coming off as a well-informed but slightly cold news feature. Still, Stewart's penchant for revealing political commentary is well served in this medium and makes Rosewater an important achievement in what hopefully becomes a fruitful filmmaking career. This entry was posted on Friday, September 11, 2015 and is filed under Book adaptation,Corruption,Friday Flicks,Injustice,Iran,Jon Stewart,Journalism,Maziar Bahari,Movie Review,Politics,Rosewater,The Daily Show. You can follow any responses to this entry through the RSS 2.0. You can leave a response. It is definitely worth a watch. I just wish it could have been more that it was.